This Easter, discover how Jesus' death and resurrection put an end to sin, shame, and so much more. 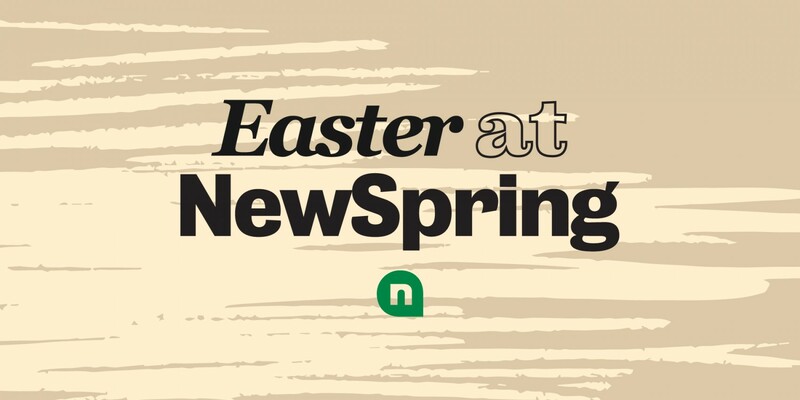 Find a NewSpring campus near you. At KidSpring, babies through fifth-graders learn about Jesus on their level. Easter is a big deal in KidSpring because it’s the day we celebrate that Jesus is alive! This year, we’re throwing an Easter Eggstravaganza. Kids will enjoy games, candy, dancing, prizes, and more as they learn what Easter is all about. KidSpring is a safe, age-appropriate environment where kids fifth grade and younger have their own service with singing, a Bible lesson, and small group time. To see what kids are learning, check out KidSpring’s YouTube channel. Gatherings last about an hour and 10 minutes. We start by singing three to four songs, then you’ll hear from a member of our teaching team. To get a feel for our teaching style, check out the current series. At the end of the gathering, we respond to what we’ve heard by singing, praying for one another, and bringing our tithes and offerings. Most people dress casually, but you are welcome to wear whatever makes you comfortable. If you’re excited about wearing an Easter dress or breaking out those seersucker pants, do it! We promise you won’t be the only one. Fill in the blank with whatever fear you have about not being accepted: divorced, single parent, broke, an addict, a skeptic, etc. Everyone is welcome at NewSpring. So come as you are, and we’ll see you this Easter!